Curious. Would I have to register this? It’s recommended you buy horse carrots if you want spiral carrots. Really. I am declaring 2018 as the Year of the Kitchen Gadget. 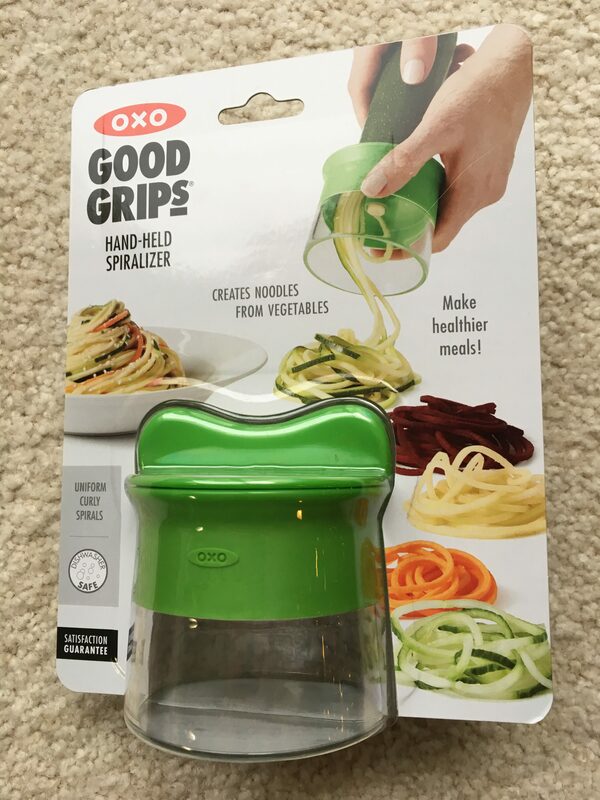 And that’s not just because I received a spiralizer as a Christmas gift. 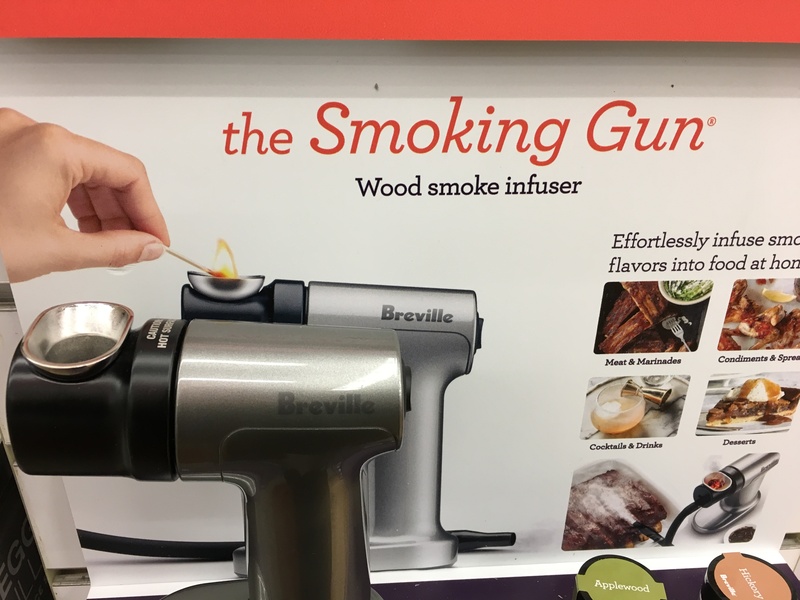 I’ve also decided that The Food Network and HGTV are in cahoots and America’s need for a pantry in every kitchen is a result of our obsession with kitchen gadgets from garlic roasters to smoking guns to this year’s favorite, the Insta-pot. My mother was a fairly average cook and our pantry-less kitchen in our 1930’s bungalow was perhaps a bit larger than others. Every night, we had a typical midwestern dinner – meat, potatoes and vegetable. A dish of canned fruit was frequently dessert. What I’m astonished to imagine is that my mother (and probably yours?) was able to prepare nutritious meals using only the tools she had available in one drawer of utensils. You know, a couple of wooden cooking spoons, a bowl scraper/ rubber spatula or two, a pancake turned, wire whisk, cheese slicer, vegetable peeler, a rotary beater, and assorted mismatched knives. A mixer, electric frying pan, colander, toaster and box grater rounded out the kitchen prep items beyond the assorted pots and pans and baking dishes. Eventually, a crockpot was added. Yet today, I, who am not cooking for a family of six, have three kitchen utensil drawers and three counter-top utensil holders. One of those is specifically for 14 different wire whisks. I’ll admit, that’s a bit of a thing for me. Occasionally, I’ve seen an item used on TV or in a magazine and knew I just had to have it. It’s the only explanation I have for my mandoline. I have to dust it more often than wash it from use. Please tell me I’m not the only one who does this? I once went through three garlic presses before I finally discovered I could buy garlic already minced. I never looked back. As a culture, we are on kitchen utensil/ gadget overload! How did this happen? I was recently wandering the aisles of a major retail store that caters to our home needs for the bedroom, bathroom and beyond. Kitchen isn’t mentioned in their name, yet they have walls and walls laden with ladles, and every possible item you can cram into a kitchen drawer or shelf. Some useful, some useless and some downright stupid. 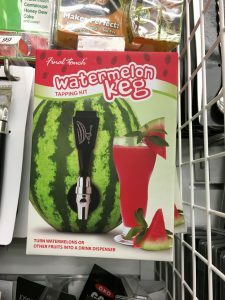 Like a watermelon keg. What happens when the seeds clog the tap? Or a kale stripper. I prepared kale once. A stripper isn’t going to get me any closer to twice. And I’m not sure there’s a huge demand for mango splitters in Michigan, but hey, maybe. I’m not knocking the pineapple corer doo-hickey though – if I ever buy a fresh pineapple, I’ll let you know how mine works. Instead of making 2018 the year of the gadget, maybe I’ll make it the year of the gadget purge. I’ll try and figure out which of the three pizza cutters I’ll keep and if I really need three graters. Or a tea infuser. Or a cherry pitter that comes out every four years? I need to work fast though. I have a new spiralizer I need to make room for, and who knows what will be next. Too cute, and so true! Thanks, Leslie. I can tell I’m not the only one who has collected an assortment over the years. Love it! My favorite useless gadget is my mezzaluna which I bought because it was cute and it’s fun to say the word. I tried it once to chop herbs and quickly learned that using a knife is easier and takes half the time. Plus, 99 times out of 100 I’m only going to use McCormick’s anyway. Happy new year, Pam! Oh my gosh – a mezzaluna? I need to look that up. Maybe I needone of those, too! Agood basic knife – yep, it can eliminate half the stuff I have. Thaks, Kate, for taking the time to read and comment. Thank you, Kathy. Yes, there are many worse addictions. I know what you mean. I just got an instant pot which I am trying to learn how to use and necessitated several cookbooks. And they don’t fit in a drawer. I also have several drawers and a holder on the counter full of utensils. I already had a spirilizer. Thank you, Gail. I’m afraid I’m going to have to look into an insta-pot. Seems I might need this. My daughter in law LOVES her InstaPot and raves about it. There are constantly pictures on Facebook of her latest dinner with how quickly it was ready. BTW I have only one utensil drawer but it is the biggest one in my kitchen. I do have my sharp knives in my freestanding butcher block across the room and have resisted the crock on the counter so far. One year I got an electric stick of butter melter as a gift! I had already learned to melt butter on the stove and then in the microwave over the years. 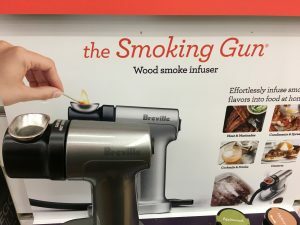 This must be better because it had a detachable cord and a selection of nozzles for unique butter situations – like buttering your corn in the cob! Okay, this is the funniest thing I’ve ever read. Thank you, Teresa, for making my day. Nope, I’m not getting that gadget. Thank you for reading and taking the time to comment. Lots of people can relate, I’m discovering. The pineapple corer works great! It also makes it easy(ier) to use the pineapple rind as a container for a tropical drink so you can pretend. You’ve convinced me. I’m buying a pineapple this week just so I can use it… and have a fancy drink. But will I need to get drink umbrellas then, as well? 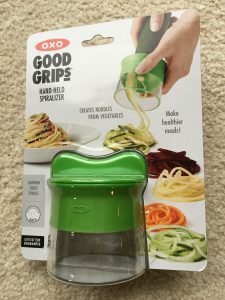 No idea what a spiralizer is. We’ve managed to cut back to so little that, well.. are down to just one drawer. The hardest thing to find as we restocked our new kitchen, again, was an under the cabinet paper towel holder and flexible cutting boards. Who’d of thought we’d have to order on line since Target, Wal-Mart, Big-Lots, and 2 different grocery stores, didn’t carry them. P.S. Really missed kale in Turkey since they don’t grow it. There’s nothing to miss about kale, but glad you have access to it now. A spiralizer is just as it sounds – cuts typically a vegetable into a long spiral shape. Because then it tastes better. Thanks for the comment. I bought a spiraizer last summer…tried it once. No spirals, just 3 inch long strings of zuchini. Let me know when you master it because I need training! Ha! 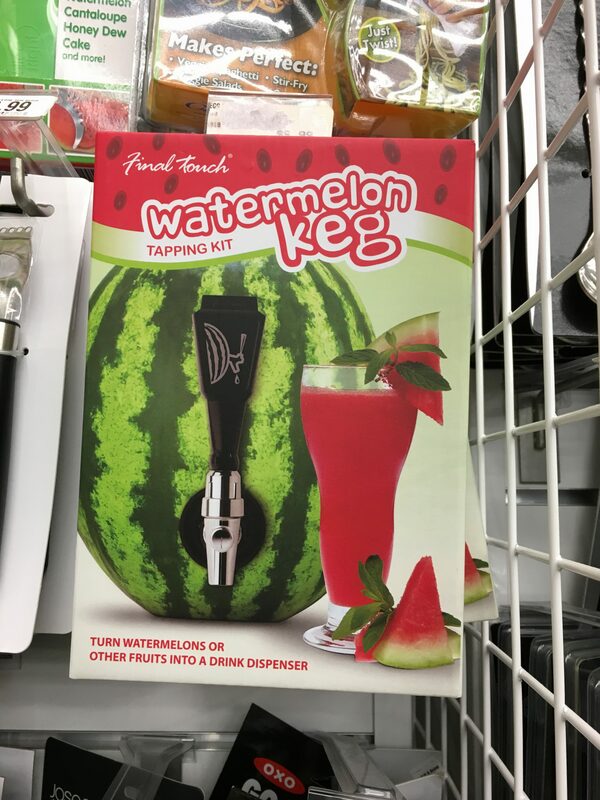 I’ll be giving zuchini a good spin next weekend. Think I might need to post pics in my next blog. Thanks for reading and commenting. This has been fun. I was going to try kale but when the recipe indicated it should be massaged first, I decided it was too high maintenance. And, the spiralizer I desperately needed last spring remains in its unopened box. I’m considering putting all my kitchen gadgets into one box in another room for the next year to see which I actually seek out and use. Thanks for the comment. I like your approach – I keep using the same five or six utensils anyway. Now about that kale – massage it first? Oh, maybe that was the step I missed. Yeah. Don’t think it matters. Wow, look at all those gadgeteers (people who love gadgets)! Being the cook that I am, I think Mom’s kitchen drawer would work just fine for me. By the way, I have 2 kale plants growing in the kitchen window sill right now, we had some for lunch today. Parsley plant is in the back room. Wait? How can you eat kale without a stripper? Matter of fact, how can you eat kale? Just kidding. Thanks for visiting my site! I agree about kale: never-again.